The Progressive Gazette: West’s antiquated unipolar world collides with the East’s vision of a multipolar future. West’s antiquated unipolar world collides with the East’s vision of a multipolar future. 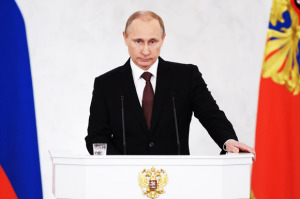 While Reuters then attempted to spin the comments as Russian paranoia, in the wake of recent events in Ukraine, the timelessness and accuracy of President Putin’s assessment years ago are apparent. For years the West has been cultivating a proxy political machine inside of Ukraine for the purpose of peeling the nation away from its historical and socioeconomic ties to Russia. The deep relationship between Western corporate-financier interests on Wall Street and in London and the opposition in Ukraine are best summarized in PR Weeks “Analysis: PR gets trodden underfoot as sands shift in Ukraine.” In the article, the involvement of some of the most notorious corporate lobbying firms on Earth, including Bell Pottinger and the Podesta Group, are revealed to have been involved in Ukraine’s internal affairs since the so-called “Orange Revolution” in 2004 – a coup admittedly orchestrated by the West and in particular the US government. The article chronicles (and defends) the continuing, unabated meddling of the West up to and including the most recent turmoil consuming Ukraine. PR Week’s article revealed that heavily funded networks propping up the proxy regime in Kiev are sponsored by “individuals and private companies who support stronger EU-Ukraine relations.” It is these Western corporate-financier interests, not Ukrainian aspirations for “democracy” and “freedom,” that kicked off the “Euromaidan” mobs in the first place – and will be the driving force that misshapes and deforms the regions of western Ukraine now overrun by the West’s proxies.